Wilier was founded in 1906 by Pietro Dal Molin in Bassano del Grappa (Veneto, Italy) and is one of the best known names in Italian cycling. Following WWII Wilier formed a professional cycling team led by Giordano Cottur of Trieste. In 1945, the name of the brand was changed to Wilier Triestina, and the distinctive copper colored finish became a trademark of Wilier Triestina. The great Italian cyclist Fiorenzo Magni won the 1948 Giro d’Italia upon a Wilier Triestina , in 1952 the factory ended production and left cycling. 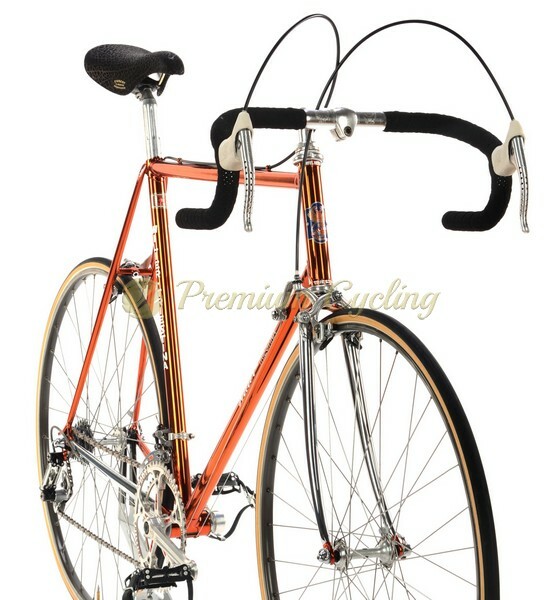 However, in 1969 the Wilier Triestina marque was reconstituted and once again entered the world of pro- cycling. In 1985 and 1986 Claudio Corti won the Italian national championships, riding one of the most beautiful racing bicycles ever to grace the pelotons of professional cycling – Wilier Triestina Cromovelato ”Gioiello Ramato” (”Copper Jewel”). A copper finish is one of the most recognizable frame colors in cycling and is easily identified with Wilier as celeste is identified with Bianchi. 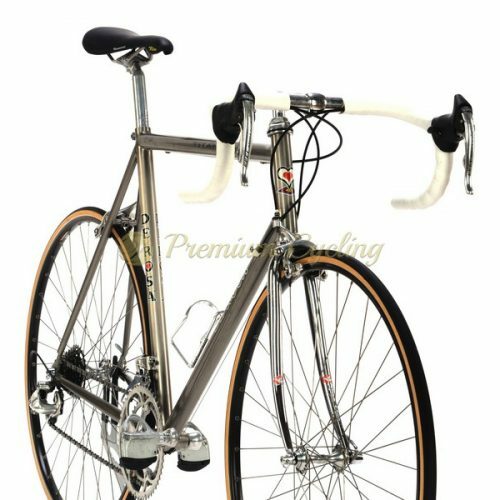 The Gioiello Ramato (Copper Jewel) is a lugged steel frame featuring a chrome fork and chainstay in the classic style. The beautiful, copper finish was obtained through a long and complex process called ”cromovelato” (”Ramato” means copper plated in Italian) in which copper laquer was applied over the chrome finish. Proudly presenting one of the most beautiful bikes ever – Wilier Triestina Superleggera Ramata 1983. The frame is made of Columbus SL, Campagnolo drop-outs, and shows stunning Wilier engravings and cut-outs with beautiful Wilier head badge on the headtube. Only the best parts are good enough for such an extraordinary frameset so this beauty is build with top of the line Campagnolo Super Record groupset, 3ttt cockpit, Mavic GP4 rims and San Marco Concor saddle. Perfect in every detail. Love at first sight. L’Eroica ready. Condition: The frame was completely refubrisehd by Wilier guy, never riden since then. No cracks, no dents, not bent. Campagnolo Super Record groupset is in excellent condition. All parts are working fine.